Rice University researchers have configured their previous invention of Laser Induced Graphene (LIG) into flexible, solid-state microsupercapacitors that rival current leading ones for energy storage and delivery. 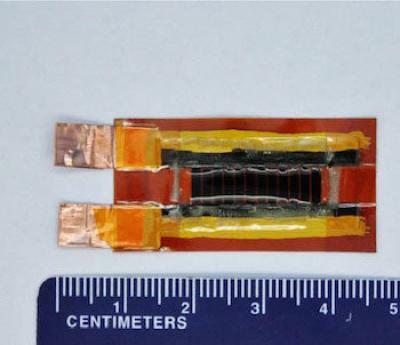 The LIG microsupercapacitors reportedly charge 50 times faster than batteries, discharge more slowly than traditional capacitors and match commercial supercapacitors for both the amount of energy stored and power delivered. The devices are made by burning electrode patterns with a commercial laser into plastic sheets in room-temperature air, eliminating the complex fabrication conditions that have limited the widespread application of microsupercapacitors. The microsupercapacitors' capacitance of 934 microfarads per square centimeter and energy density of 3.2 milliwatts per cubic centimeter rival commercial lithium thin-film batteries, with a power density two orders of magnitude higher than batteries, according to the researchers. The devices displayed long life and mechanical stability when repeatedly bent 10,000 times. Their energy density is owed to the nature of laser-induced graphene (LIG). The scientists discovered last year that heating a commercial polyimide plastic sheet with a laser burned everything but the carbon from the top layer, leaving a form of graphene. Somewhat unexpectedly, rather than a flat sheet graphene, the laser left a spongy array of graphene flakes attached to the polyimide, with high surface area. The researchers treated the LIG patterns with manganese dioxide, ferric oxyhydroxide or polyaniline through electrodeposition and turned the resulting composites into positive and negative electrodes. The composites could then be formed into solid-state microsupercapacitors with no need for current collectors, binders or separators. The scientists are excited about this invention, despite the face that commercial abilities have not quite been achieved, and are positive the day is coming when supercapacitors replace batteries entirely, as energy storage systems will charge in minutes rather than hours.